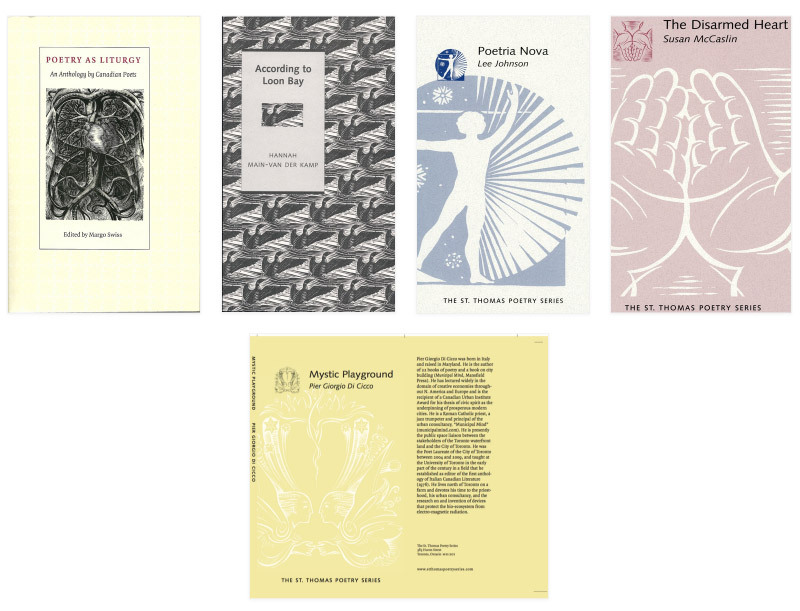 The St. Thomas Poetry Series: “excellence in both poetry and design” (Jeffery Donaldson, University of Toronto Quarterly). “these are exquisitely produced books, with each cover adorned with a hand-printed impression from remarkable wood engravings by Nancy Ruth Jackson” (Klay Dyer, Journal of Canadian Poetry). 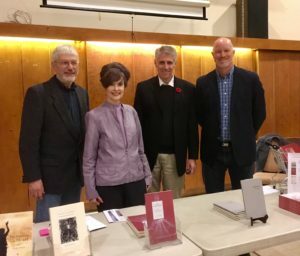 Launch of Superabundantly Alive: Thomas Merton’s Dance with the Feminine by Susan McCaslin (Langley, B.C.) and J. S. Porter (Hamilton, Ont.). Introduced by Bernie Lucht, CD, currently Visiting Professor at Ryerson University and formerly Executive Producer at CBC of “Ideas,” “Tapestry,” and the Massey Lectures. 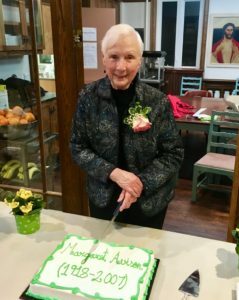 On 19 April 2018 in the parish hall, St. Thomas’s Church, 383 Huron Street, Toronto, we celebrated the centenary of Margaret Avison (1918-2018) with poetry, reflections, and music. Porcupine’s Quill Press and Brick Books were present with many of Avison’s publications available for purchase. John Terpstra with, to his right, Daniel Coleman who provided an introduction. 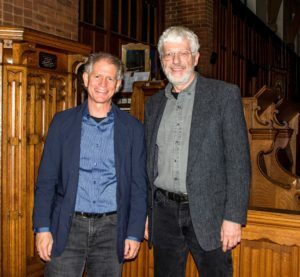 Poetry readings at St. Thomas’s Anglican Church, Huron Street, Toronto, began in 1988 in connection with the launch of the anthology Christian Poetry in Canada, ed. David A. Kent (ECW Press, 1989) and featured five poets: Robert Finch (his final public reading at age 89), John Reibetanz, Tim Lilburn, Maggie Helwig, and Margo Swiss. Spring and fall readings soon developed and then continued on a regular basis for several years. Many well-known Canadian poets visited during that time and afterwards, including James Reaney, Colleen Thibaudeau, J. M. Cameron, Anne Corkett, Joy Kogawa, George Johnston, Richard Greene, Alice Major, Barry Dempster, Gail Fox, Douglas Lochhead, Richard Outram, Susan McCaslin, and many more. The publication series began in 1996 and was intended to draw increased attention to Christian poetry in Canada. As a result, the readings after that time were often connected with the launch of new books. 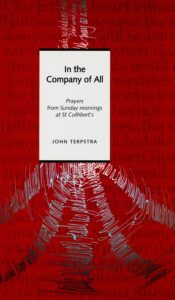 These new books were not exclusively from our own series, as we were pleased to help launch, for example, some of John Terpstra’s publications with Gaspereau Press of Nova Scotia. In November 2008, in the 20th year of the series, John Robert Colombo, Barry Dempster, W. J. Keith, and John Terpstra were invited to help launch our twenty-fifth publication, Swim Class and Other Poems by George Whipple. 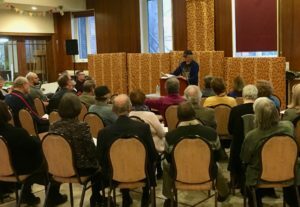 In 2013 the 25th anniversary was celebrated with readings by John Reibetanz, Richard Greene, Bernadette Rule, Margo Swiss, Philip Gardner, Suzanne Collins, and John Terpstra. A special pamphlet was also published to mark the occasion: Poems for an Anniversary. 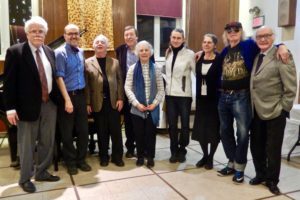 A special reading to belatedly mark the centenary of George Johnson’s birth was held in 2014 and featured four poets, two of George’s sons, and Professor William Blissett. 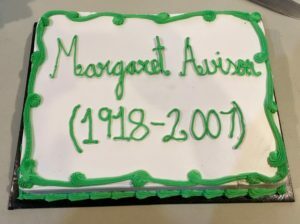 The centenary of Margaret Avison (1918-2007) was celebrated in April 2018 with eight readers participating. The poetry series has always identified itself with St. Thomas’s Anglican Church on Huron Street in Toronto. Both the former rector, Fr. Roy Hoult, and the current incumbent, Fr. Mark Andrews, have supported the series by allowing it to use the church and the hall for readings and receptions. There have been many loyal parishioners who have supported the series through their volunteer help, including antiquarian bookseller Hugh Anson-Cartwright (who suggested the elegant dimensions of the first books), professional editor Pat Kennedy, photographer Linda Russell, parish adminstrator Barb Obrai, Willem Hart, the late Bill Martin (who recorded many of the early readings), and John Meadows. All the books may be seen in the display case at the rear of the church. If examined, you will see that the books also prominently feature the elegant logo that Alan Fleming designed for the parish centenary celebrations in 1974. It appears at the top of this page: a carpenter’s square with four spear tips. The St. Thomas’s books are all printed on our neighbour’s presses, Coach House Printing, and its proprietor, Stan Bevington, has worked with Nancy Ruth Jackson to ensure the much admired design quality of the books. 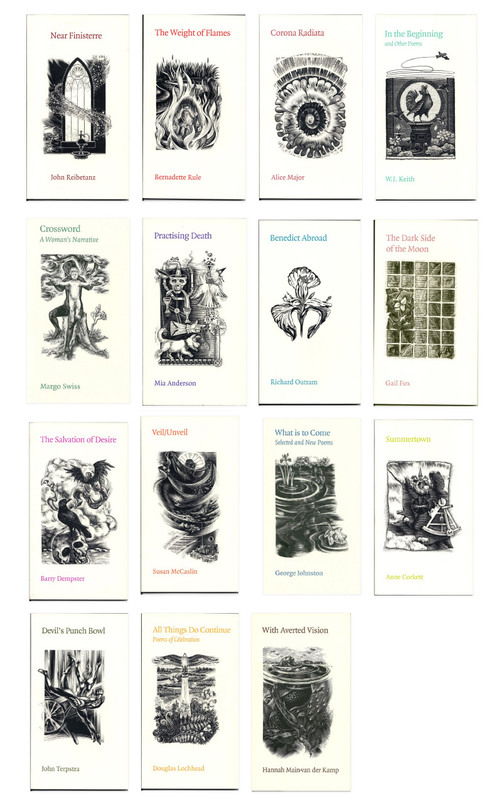 With the sole exception of Benedict Abroad (whose cover was designed by Barbara Howard), the covers for books in The St. Thomas Poetry Series have been designed by Nancy, who now lives in Montreal after years living in New Jersey as a glass blower and before that many years working in the publishing industry in Toronto. The books have been produced at Coach House Press under the direction of Stan Bevington, and in several cases the covers were individually printed by Stan directly from Nancy’s wood engravings. Nancy’s designs moved away from engravings and toward repeating patterns on the covers with the McCaslin anthology of 2002. Her approach has recently undergone a further change with the Johnson and McCaslin books of 2014 and with Di Cicco’s Mystic Playground (2015). The series is intended to be a non-profit venture, all proceeds from the sales of one book being used for the publication of the next one in the series. Generating income has always been a challenge, since poetry of any kind is not a popular genre and religious poetry is its least popular subset. 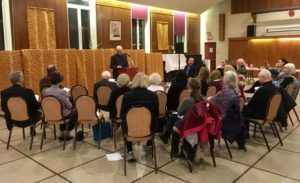 Nevertheless, it is fair to say that all across Canada among readers of poetry there is now a strong association between The St. Thomas Poetry Series and poetry of high quality.